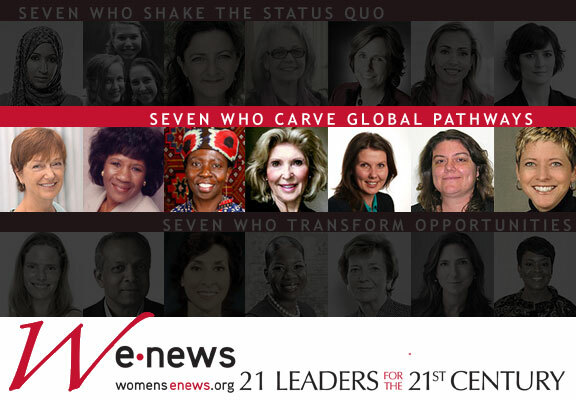 (WOMENSENEWS)–Today, Women’s eNews recognizes 21 remarkable leaders whose energy and vision spring from their lives across the globe, in India, Saudi Arabia, Kenya, Colombia, Canada, Norway, Ireland and yes, the United States, including the South. Each one, wherever they were born and in whatever circumstances, grew to develop a profound commitment to improving the lives of women and girls and have taken dramatic action to confront the inequality in the United Nations, in the U.S. Congress, in war zones, in the Saudi gender apartheid, in maternity care centers, in developing economies, in the media–and even the committee who picks the moderators for the U.S. presidential debate. A team of three is still in high school, one leader recently graduated from law school, others are in the peak of their careers. All are inspirational. Women in the U.S. military are raped, sexually assaulted and harassed by their comrades in arms. These powerful, disturbing, stories were told by two exemplary journalists in two very different media. Helen Benedict, an author and professor of journalism at Columbia Graduate School of Journalism in New York City, was the first reporter to uncover the magnitude of sexual abuse of U.S. female soldiers during the Iraq and Afghanistan wars. Her efforts prompted a precedent-setting class action against the Pentagon on behalf of women and men who had been sexually assaulted while on military duty. Together, these journalists used the ammunition of words and images to call the nation’s attention to these betrayals and the systemic violence against women, routinely ignored by military brass. This year, for the first time ever, Women’s eNews will give two Ida B. Wells Awards for Bravery in Journalism. Six additional 21 leaders have used media to move the needle for women’s rights with astonishing success. Manal Al-Sharif began a women’s rights revolution in Saudi Arabia. She was one of the organizers of a right-to-drive protest scheduled via Facebook. The resulting video went viral; she lost her job and left for Qatar, but read her blog and know her agenda is now much broader and the level of national and international support continues to grow. A Georgetown University law school student, Sandra Fluke, set off a similar uproar in the United States when she argued before a congressional committee that Catholic institutions should be required to include contraceptive coverage in their health care plans. Her testimony was broadcast on C-Span and made national news. She remained unflustered despite the repeated vitriolic attacks against her from Rush Limbaugh and she later rejected his apology. “Some fights are worth the scars. Sensitive issues produce the worst scars because they are worth fighting for,” Fluke says. Counted as one 21 Leader, the team of New Jersey high school students Emma Axelrod, Sammi Siegel and Elena Tsemberis saw something that needed to be fixed and they figured out how to make it happen. The trio started an online petition at Change.org asking the Commission on Presidential Debates to select a female presidential moderator for the Obama-Romney debates. The petition quickly gathered more than 100,000 signatures even before the effort received press coverage. The commission has yet to acknowledge the trio, but Candy Crowley, CNN chief political correspondent, became in October the second woman in 20 years to moderate a U.S. presidential debate. Barbara Bridges created a place in the western United States for women’s films to be viewed and taken very seriously. She is the founder of Denver‘s Women+Film, an organization that holds screenings and discussion forums on films made by women, about women. “We are telling the stories for the women behind the cameras and the stories of the women on camera,” Bridges says. A refugee from Lithuania as a child, Jurate Kazickas has spent her life working to assist other women fleeing their homelands for the Women’s Refugee Commission and supporting efforts to improve the status of women in news media. Kazickas, a member of the Women’s eNews advisory committee, worked with the International Women’s Media Foundation and created the first-ever conference for female journalists working in the former Soviet Republics and plans to do it again. Dr. Naveen Rao is the head of the new international Merck for Mothers program. The $500 million initiative focuses on three key issues: postpartum hemorrhage, preeclampsia and family planning. The first two are the leading causes of maternal death worldwide and the latter provides one of the most effective ways for women to protect their health. The initiative primarily focuses its efforts in South Asia and sub-Saharan Africa; globally, half of maternal deaths occur in sub-Saharan Africa and a third occur in South Asia. Merck for Mothers also plans to address maternal mortality in the United States, the nation with the highest maternal mortality rate in the developed world. President and co-founder of the James R. Jordan Foundation, Deloris P. Jordan, is currently working with a group of global partners to further develop the Kenya Women’s and Children’s Wellness Center, the first establishment of its kind in the country. The Kenya Women’s and Children’s Wellness Center includes a Gender Violence Recovery Center, a forensic laboratory to perform the necessary tests to prosecute rapists and other assailants, a women’s and children’s outpatient clinic, a 170-bed inpatient hospital, a learning center and a family hostel. Grief caused a volunteer in a Cartagena, Colombia, maternity hospital to change her life’s course to become a champion for maternal and infant health. In 2000, businesswoman Catalina Escobar Restrepo held a dying infant in her arms. Less than a week later, her toddler son died after a fall at home. Escobar founded a foundation that brings reproductive education and health care to more than 2,000 teen mothers and has dramatically decreased the region’s maternal and infant mortality rates. Like Mayberry, radio-talk show reporter Ellen Ratner visited a nation in need and became compelled to help the women. She does not use media however. She now visits war-torn Sudan four times a year, home of a brutal decades-long civil conflict. There, she spearheads innovative trainings in breathing and meditation for women in South Sudan who are living with the emotional, physical and financial damage from the war. She has also organized micro-enterprises such as jewelry making and silk screening. One woman told Ratner that the income allows her family to eat on a regular basis. At home, she organizes a national “Time to Talk Day,” with leaders in the U.S. anti-gender violence movement booked as guests for multiple talk radio hosts. Although not directly involved in improving women’s health care, Dr. Dara Richardson-Heron, the CEO of YWCA USA, is a physician and quality health care advocate with deep experience working to reduce race-based health disparities in the United States. The YWCA serves 2 million U.S. women and girls each year and has an explicit commitment to combat racism. African American women die three to four times as often as white women as a result of pregnancy and the statistic has not changed since 1940. African American women have similar poor health outcomes in a wide range of other health events. As the head of the Verizon Foundation, Rose Stuckey Kirk expresses a similar viewpoint. Verizon Wireless is a long-time sponsor of Hope-Line, which turns no-longer used cell phones into support for domestic violence victims and survivors. Kirk is also looking for new ways to reduce the toll of violence on women’s lives through the use of communication technology. Domestic violence is often a very intimate act but at the same time reflects a community’s regard for women and girls. Christine Mau, a survivor, joined a small group of leaders in the anti-violence movements with one big idea: to end domestic violence and sexual assault. Mau was instrumental in defining the mission, creating the brand and commercializing the project. Their work evolved into the creation of the NO MORE symbol, designed to galvanize change and radically increase the awareness of domestic violence and sexual assault. NO MORE campaigns will be launched simultaneously by a host of activist organizations this spring. A leading voice on the issues of funding women’s rights and social justice for women and girls in Canada, Margot Franssen is co-chair of the National Task Force on Human Trafficking of Canadian Girls and an active philanthropist for women and girls. An entrepreneur, Franssen launched the Body Shop franchise in Canada and the United States, opening 130 stores in Canada and 50 in the United States. Under Franssen’s leadership the Canadian operation ran the annual Stop Violence Against Women campaigns through each store. The United Nations recognized the company for bringing the issue to the attention of the public, as over $1.3 million was raised for prevention and recovery programs and 192,000 hours of community work was performed in women’s shelters at the company’s expense. In the most violent areas of conflict, from Darfur to Liberia to Haiti, Heidi Lehmann, director of the women’s protection and empowerment team at the International Rescue Committee, is charged with assuring the safety of women and girls When she is on the scene, she finds she must spend hours convincing whoever is in charge that keeping women and girls safe in emergencies is as essential as providing food, water and shelter. And when she is in the committee’s headquarters, Lehmann must spend hours persuading other international stakeholders to cooperate, collaborate and coordinate the work needed to protect women and girls, including developing policy and programs. The person who has funds specifically targeted to grassroots women-led organizations across the globe is Musimbi Kanyoro, president and CEO of the San Francisco-based Global Fund for Women. As a life-long champion for women and girls’ health and human rights and women-centered philanthropy, Kanyoro has emphasized at whatever position she has held the importance of providing resources in order for women to become leaders, and now that is in her job description. While Lehmann is on the ground and Kanyoro is supporting women’s leadership in many of the same places, Gry Larsen is in Oslo pushing for women’s rights through the nation’s foreign policy. As deputy foreign minister of Norway, she implements the country’s goal to advocate for the political, economic and health rights of women and girls in international forums such as the U.N. In 2011, for instance, during the high-level meeting on Libya, only four countries, including Norway, specifically addressed the importance of gender equality in their statements. The first woman to be elected president of Ireland, and a former United Nations High Commissioner for Human Rights in Geneva, Mary Robinson founded the Mary Robinson Foundation-Climate Justice (MRFCJ). A core principle of the foundation’s work is that women’s voices must be heard and their priorities supported as part of climate justice. Robinson says the biggest issues facing the future of women’s rights are climate change and a failure of world leaders to continue to support reproductive rights. A challenge she says that gets her out of bed in the morning. Also working on the global level, Kathy Bonk, founder and executive director of the Communications Consortium Media Center, has been at the forefront of dozens of media campaigns in successful efforts to change U.S. and global policies affecting women as far back as the Vienna conference in 1993, which declared for the first time that women’s rights were human rights.